The rescue of 11 Asian Elephants (Elephas maximus) from a mud hole inside the Keo Seima Wildlife Sanctuary, Mondulkiri Province, Cambodia, on 24th March 2017 avoided a tragedy for wildlife conservation in Cambodia. 'If the community had not come together with the Wildlife Conservation Society (WCS), ELIE and the Department of Environment to rescue these 11 Asian Elephants, this would have been a tragedy" said Tan Setha, WCS Technical Advisor to the protected area. "This herd consisted of three adult females and eight juveniles of various ages, including a male that had almost reached maturity. These elephants represent an important part of the breeding population in Keo Seima Wildlife Sanctuary, and their loss would have been a major blow to conservation." 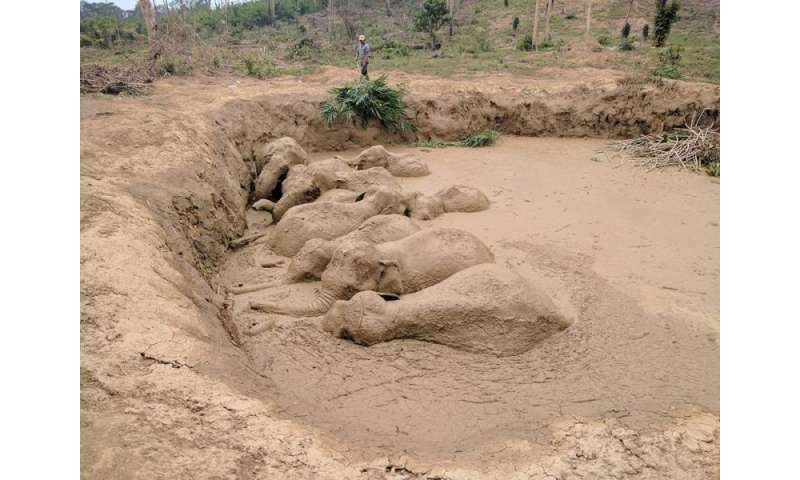 The mud hole where the elephants where trapped was a bomb crater left over from the Vietnam War that had been enlarged by farmers to store water. When local farmers discovered the elephants they notified the Department of Environment, who in turn notified WCS who were able to mobilize a rescue. "This is a great example of everyone working together in Cambodia to save wildlife," said Dr Ross Sinclair, WCS Country Director. "Too often the stories around conservation are about conflict and failure, but this is one about cooperation and success. That the last elephant to be rescued needed everyone to pull together on a rope to drag it to safety is symbolic of how we have to work together for conservation" he added. WCS, in collaboration with Government of Cambodia through Ministry of Environment (MoE) and the Department of Environment (DoE) and local communities, has been conserving the Keo Seima Wildlife Sanctuary for over 15 years. KSWS is one of the most important sites for Asian Elephants in Cambodia and also supports other important wildlife populations. Elephant conservation work in KSWS is supported by the United States Fish and Wildlife Service.